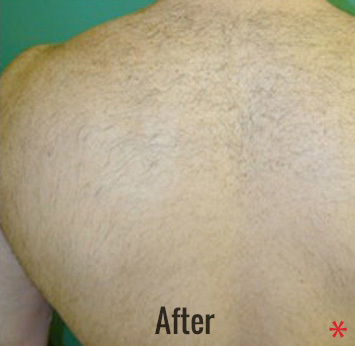 Both men and women deal with the inconvenience, irritation, and embarrassment caused by having excess hair on the body. Constant shaving not only becomes an obvious hassle but it, in turn, causes ingrown hairs, skin aggravation, and potential discoloration. 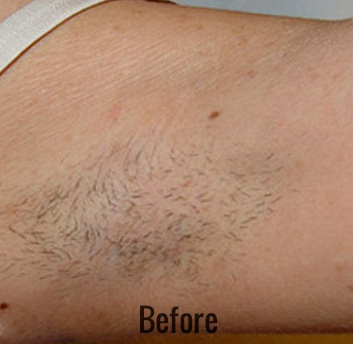 Laser hair removal is the solution to our “hairy” problem! Laser hair removal treatments work to destroy hair at the follicle rather than skimming it off the top like done with shaving. If you are interested in finding out more about laser hair removal with the latest technology, we encourage you to contact Skin Perfect Medical Aesthetics to schedule a consultation with one of our specialists and see if this treatment is right for you! 10.1 How does the Lumenis laser hair removal process work? 10.2 Are there any restrictions on my activity after treatment? 10.3 How does the Lumenis laser hair removal compare with other hair removal methods? 10.4 How does laser hair removal compare with electrolysis? 10.5 What do laser hair removal treatments feel like? 10.6 How many treatments will I need? 10.7 What happens after the treatment? Laser hair removal is a highly popular treatment that is used to eliminate hair on areas of the body that causes inconvenience, discomfort, or self-consciousness. The innovative laser technology does this by using invisible beams of light with a constant source of heat that penetrates to the hair follicle, disabling and then destroying it at its root while preserving the surrounding skin. It normally takes multiple treatments in order to destroy the majority of the hair follicles in a given area. Laser hair removal treatments not only remove hair but it also helps smooth out the skin that has become irritated and bumpy due to constant shaving. The Lumenis laser, Skin Perfect Medical Aesthetics laser hair removal system of choice, has a cooling mechanism that keeps the skin cold for increased patient comfort. Although laser hair treatments are safe and comfortable, patients often state they experience a feeling like a snapping rubber band. The cooling technology lessens any unpleasant sensation patients might experience while undergoing treatment. 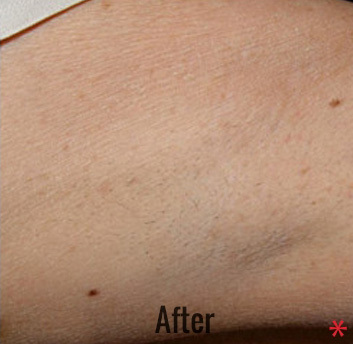 Laser hair removal provides long-lasting results after completing a series of treatments. The Lumenis laser hair removal system targets deep into the follicle itself to destroy the hair entirely, not just focusing on removing hair from the surface. The light energy works in waves to be properly absorbed by the endogenous chromophore melanin in the hair. This is used to heat the follicles and, in turn, cause necrosis which ends the regenerative process. But the most important aspect of Lumenis laser is that it can be used on different skin types. Many lasers do not treat multiple types of skin due to the lack of variety of depths that most machines provide. The ability to treat different types and colors of skin is what makes the Lumenis laser the leader in its market. 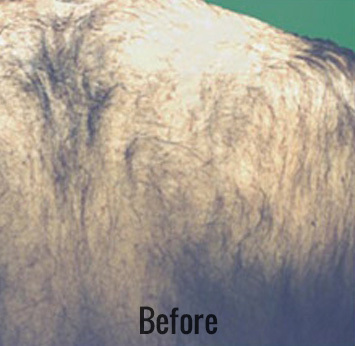 This advanced technology can reduce hair on the majority of people looking for treatment. The Lumenis laser works to remove hair through a heating process that will work to destroy the hair entirely and help prevent new hair from growing. Lumenis uses a CHILLTIP on the handheld laser piece in order to provide comfort while undergoing the heated treatment. This cooling method is sustained throughout the entire procedure, keeping the skin cold before and during the laser treatment. The HIT feature consists of the vacuuming method used to remove the hair. The vacuum pulls the skin closer to the heat, treats the target area and then releases the skin, leaving it unharmed and the underlying hair damaged, as intended. An ideal candidate for the Lumenis laser hair removal is someone who has an area of the body in which they would like to reduce the amount of hair. Patients who consider this should have hair that is darker than their skin tone for optimal results. This laser can be used on the majority of the body and can treat a variety of different types and colors of skin, allowing virtually anyone to be a candidate. However, those undergoing this treatment should be aware that results will vary from person to person, as well as the number of treatments that are required. Laser hair removal has provided many people with an overall increase in quality of life, allowing them to be more confident and have a more positive body-image of themselves once the excess hair is removed. No more hesitation when someone proposes a last-minute beach trip, no more hesitation wearing shorts, and no more hesitation going shirtless. 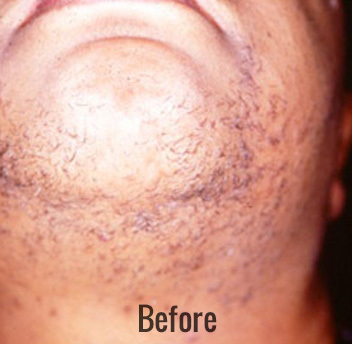 Laser hair removal is an efficient, long-lasting method for reducing unwanted hair growth. From the very first treatment, hair growth will begin to slow and unwanted hairs will begin to thin. After completion of a recommended series of treatments, patients can expect to see a 70–90% reduction in hair growth and results are long-lasting. It should be noted that this treatment is not a permanent solution for hair removal but will provide lasting and very satisfying results for each and every patient once finished with the allotted treatments. During the initial consultation, one of our laser hair removal experts will listen to the patient’s concerns and desired outcomes for the hair removal. They will be required to review their medical history and any medications that are currently being taken. All of this information will be needed in order to determine candidacy. Our physicians work hard to ensure safety and determine what will be the most beneficial course of action to obtain the patient’s particular desires. Next, the physician will examine the specific treatment area to ensure the patient will benefit from the laser hair removal process. The expert will be able to determine what the best course of action will be, depending on what the patient is asking for and their particular skin type. Because the majority of patients are considered candidates for the treatment, the consultation is usually fairly quick and treatment can normally be done on the same day unless otherwise determined. Numbing cream is not necessary, but it is available for those who request it. These patients should come 30 minutes prior to their appointment time. The laser hair removal expert will then provide protective eyewear to ensure safety. Treatment will begin by applying the handheld laser piece to the problem area; while doing so, the CHILLTIP will minimize discomfort. When placed against the skin, the laser will suction the skin using the HIT feature which will bring the hair and skin closer to the light energy, ultimately heating the hair follicles, destroying them, and helping to prevent hair from regrowing. This process is repeated until the entire area has been treated and then the patient is able to return to their daily activities. Patients may feel slight stinging during treatment, but discomfort does not last after treatment. There is no downtime at all after laser hair removal treatment. Patients should stay out of direct sunlight and wear sunscreen constantly for about a month. Over the next month, the hair follicles will begin to fall out and the thinning of hair in the treatment area will become more noticeable with each treatment. It is completely normal to have the look of a mild sunburn for a day following treatment. If this does occur, cold compresses or moisturizer can help to alleviate this. Results will vary per patient since some follicles will be dormant, or resting, during treatment. This is a period of time where the follicle is not active, meaning that the light energy will not have an effect on that particular follicle. For this reason, multiple treatments are required. We usually recommend 6-8 sessions spread 4-6 weeks apart depending on the treatment location. When considering laser hair removal treatments, we are at your service to help you obtain your aesthetic desires. Call us today and set up a consultation to find out if this treatment is right for you! How does the Lumenis laser hair removal process work? Our state-of-the-art lasers work by selectively targeting and destroying the hair follicles thereby preventing re-growth of new hair*. This leads to a reduction of unwanted and unsightly hair anywhere on your body without damaging the surrounding skin*. Our laser’s unique design and cooling mechanism allow for it to treat all hair and skin types safely, painlessly and effectively*. You can return to your normal activities right away, but some redness may occur*. The use of sunscreen is recommended on any treated areas exposed to the sun. How does the Lumenis laser hair removal compare with other hair removal methods? Shaving, waxing, and depilatory creams are all temporary methods which must be repeated on a frequent basis. The Lumenis offers hair reduction for long-lasting results. Electrolysis is a tedious, invasive, and painful process that involves inserting a needle into each individual hair follicle and delivering an electrical charge to them one at a time. 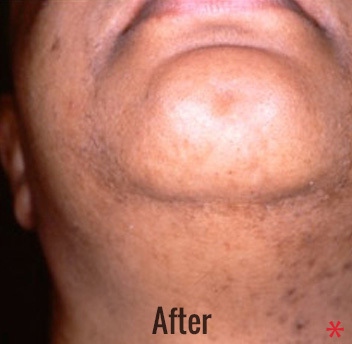 Electrolysis often requires years of treatments at regular intervals. By delivering light energy to hundreds of hair follicles at a time, the Lumenis laser effectively treats an area in seconds that would take over an hour with electrolysis. The Lumenis handpiece cools and soothes as it glides along your skin. When the pulse of light is delivered, some patients experience a mild pinching or stinging sensation*. Most areas require a minimum of 6 treatments. However, the number of Lumenis treatments required for optimal long-term benefits depends on multiple factors – hair thickness, the area treated and your hair’s growth cycle. Interestingly, not all hairs are actively growing at the same time and actually go through three distinct phases: growth, regression, and resting. Lumenis treatments work by disabling the hair that is principally in the active growth phase at the time of treatment. Since other hairs will enter this active growth phase at different times, additional treatments may be necessary to disable all of the hair follicles in a given area. Immediately following your Lumenis treatment, the area may appear a bit red and swollen, usually resolving within a few hours. Three to seven days after treatment you may experience what seems to be regrowth of hair. Actually, most of these hairs are being shed as a result of your treatment and are not regrowing. Between treatments, you should not wax or pluck your hair, but it is permissible to shave 4 days after treatment.